The use and importance of technology in teaching and learning processes is well established in teacher training programs and teaching literature; however, integration of technology in meaningful ways remains a challenge. For teacher candidates to be able to effectively integrate technology in the classrooms, they need to experience meaningful technology pedagogical practices during teacher training. This chapter synthesizes well-established and relatively new technology pedagogical strategies that could be used with teacher candidates. The aim is to provide a summary of research-based strategies for teacher educators interested in improving technology integration in their teacher training programs. Over the past three decades, there has been proliferation of technology tools that have the capability to bridge the gap between theory and practice in teacher education, if appropriately and meaningfully integrated in the teacher training programs. This chapter synthesizes technology tools and technology pedagogical strategies for teacher candidates that are imperative in teacher preparation courses. This chapter is organized in the following ways, first, existing literature is synthesized to provide a background for understanding the challenges that teacher candidates experience in the classroom, second, the chapter provides summary literature review of the importance of meaningful learning, and discusses meaningful learning theoretical framework with the goal of displaying effective technology pedagogical strategies that are informed by such a theoretical framework. In addition, the chapter discusses how specific technology can minimize challenges, and could be successfully used to enhance the processes and outcomes of learning. The limitations of the use of technology tools and ways to minimize the limitations are discussed. As a whole, this chapter provides teacher educators with knowledge of technology pedagogical strategies that support teacher candidates’ ability to transfer theory into practice. 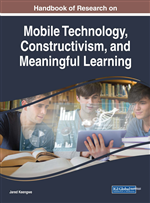 It is important to note that, the authors used a qualitative approach to arrive at two broad categories of meaningful learning and technology pedagogical strategies. The following section offers summary background for understanding teacher candidates’ challenges in the classroom during field experiences and teacher residence. Active Learning: Being able to search for new information, organize, analyze and create new meaning through the use of technology. Live Virtual Field Trip: Virtual tour in real time. Inquiry Learning: A form of active learning, where students participate in searching for information, developing experiments, analyzing data, and constructing new knowledge and skills. Electronic Brainstorming: A computer aided-approach for generating ideas individually or collaboratively. WebQuest: An inquiry-oriented lesson format in which most or all the information that learners work with comes from the Internet (or the web). Virtual Field Trip: A tour of websites and videos. Peer-Assessment: A process where students review their peer’s work for accuracy or growth using the assessment rubrics aligned with the goals and objectives of the learned materials. Self-Assessment: A process whereby students review (individually) their own work for accuracy or growth using the assessment rubrics aligned with the goals and objectives of the learned materials.